People with type 1 diabetes must be treated with insulin generally. Most of them are treated with an ICT (Intensive Conventional Therapy). This means that they must inject a long acting insulin for their basal need and additional injections with a fast acting insulin type for every carb intake. If you are taking these blood glucose readings just as a snapshot and for your bolus dose calculation you don't need to maintain a diabetes log book but then you are also giving away a fantastic tool for optimizing your whole treatment and to prevent from the feared late issues like renal failure etc.! You are enjoying a meal in your favorite restaurant and estimate the number of carbs coming with this meal. Some hours after that meal you encounter an unnormally high blood glucose level. Something went wrong. Probably your carb estimation was understated. With SiDiary on your preferred mobile device you can look at your records everywhere at any time. - You are taking insulin shots of an analog insulin type for your breakfast to damp the after-meal peak and to not must wait too long before you can start with your meal after the injection. 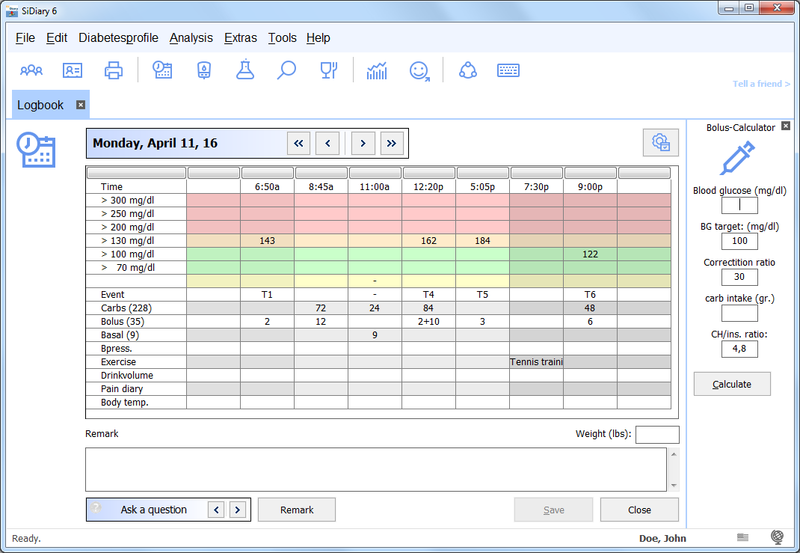 SiDiary is one of the few software products that can handle such constellation with 4 different insulin types. Tip: Don't watch your A1c ("long time blood glucose parameter") as the one and only important value, but to the ups and downs of your bg level also! The smaller they are the smaller is your risk to get concerned by problems with your eyes and the nerves although your A1c might have an acceptable range. SiDiary is supporting you with watching the standard deviation of your readings. The smaller this number is the more stable is your diabetes condition.